The arrival of spring has us all eager for summer to get here! Not that we are wishing time away because let’s be real, it’s going way too fast as it is, but we are ready for long days, lots of sunshine and summer produce! 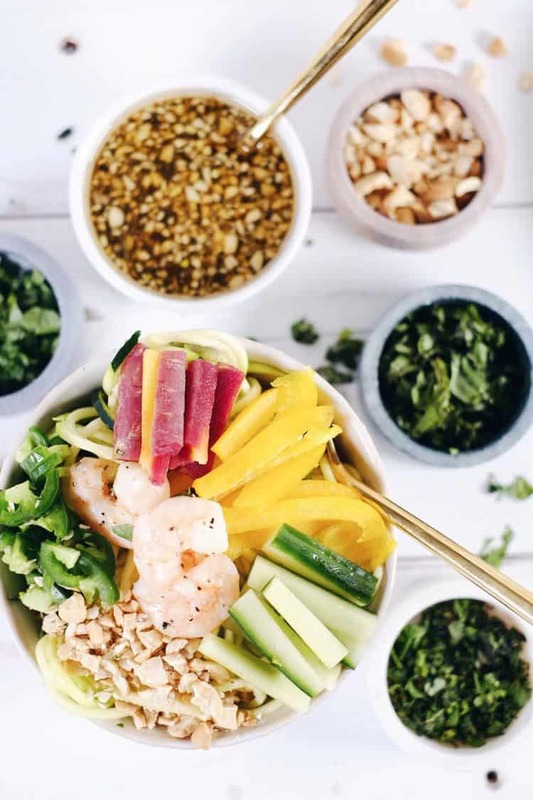 Don’t worry, in the meantime we’ll just be over here making this shrimp zoodle spring roll bowl on repeat! 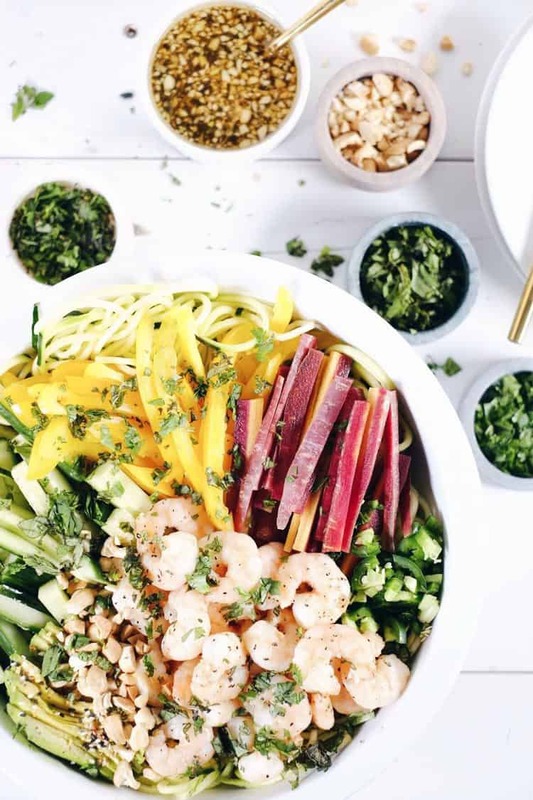 This shrimp zoodle spring roll bowl has it all! It’s packed with veggies and fresh herbs, which add tons of texture and flavor! Our favorite thing is to use rainbow carrots so there is even a pop of purple in there! You can also use whichever kind of bell pepper is your favorite for more color variety, too. Seriously though, you’ll have all your favorites with the zucchini, cucumber, carrots, bell pepper, jalapeño, mint, cilantro and basil. Plus, the creamy avocado. Don’t forget that! 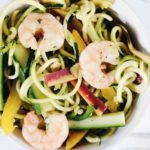 The dressing just adds to the yummy factor of this shrimp zoodle spring roll bowl with garlic, coconut aminos and lime juice. The acidity of the limes keeps the dish feeling light and refreshing, while the garlic and coconut aminos add a bit of savory goodness! Add it all into a big bowl, and mix it up! All around, the combo of the many veggies, the fresh herbs and this dressing make this zoodle bowl one that quickly becomes a favorite! It’s colorful and packed with vibrant flavors! Go ahead and chop up all the veggies to make this vibrant and satisfying dish! It’s light, yet filling and fun too! Let us know how it goes by leaving a comment below. Then, take a photo and tag us on Instagram @realsimplegood, so we can check it out! LIKE THIS RECIPE? CLICK HERE TO PIN IT AND TRY IT LATER! 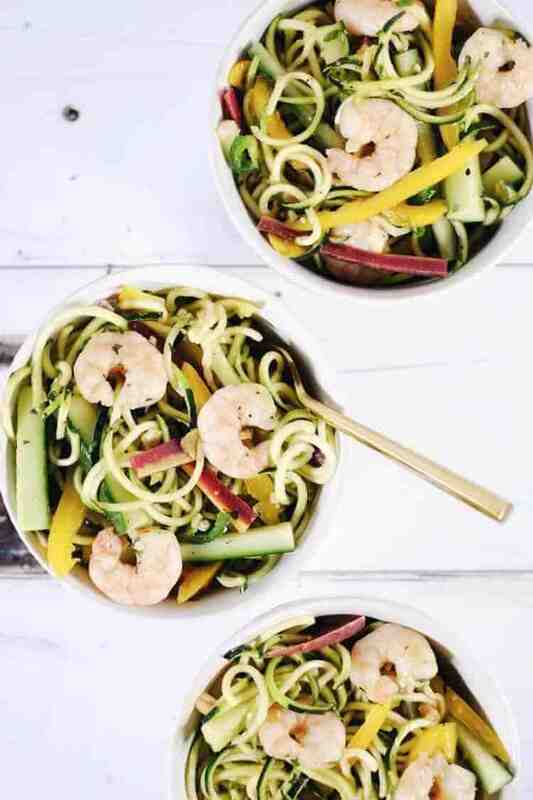 This zoodle bowl is packed with fresh veggies and herbs, with a light and refreshing dressing! First, make the sauce by combining all sauce ingredients in a small bowl and mixing well. Next, heat a large skillet over medium-high heat and add avocado oil. Season shrimp with salt and pepper. Once the skillet is hot, add in shrimp to cook. Cook shrimp just a couple of minutes each side, until pink throughout. Remove and transfer to a plate. 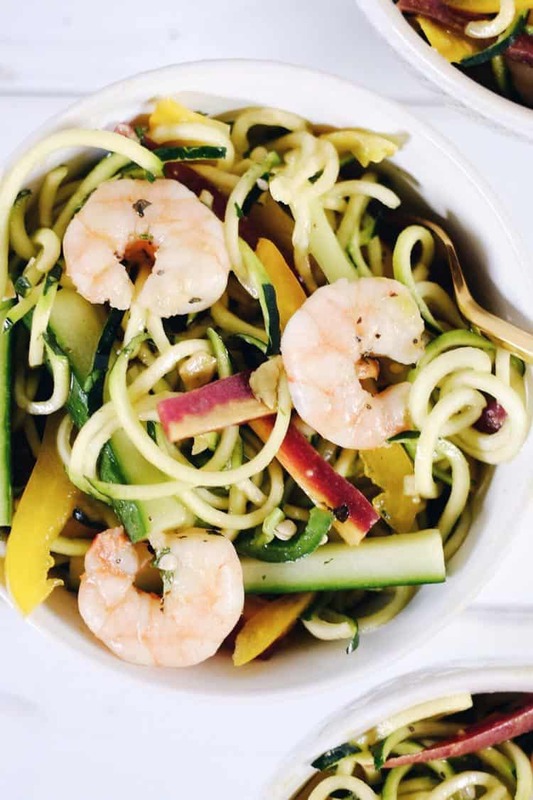 Now, turn zucchini into zoodles with a spiralizer. Add to a large bowl. 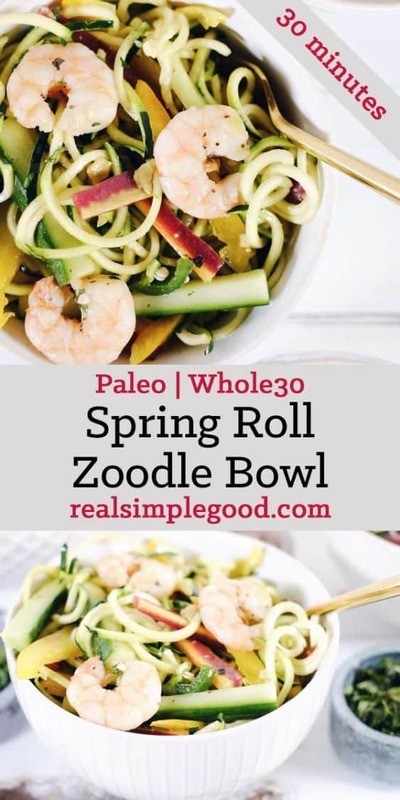 Prepare all remaining ingredients as noted and add them to the bowl with the zoodles. Add in the cooked shrimp to the bowl and toss everything to mix. Add in the sauce and toss again to coat. Serve and enjoy. Hi, we are Justin and Erica! We love cooking good food and creating simple Paleo recipes made with real ingredients.